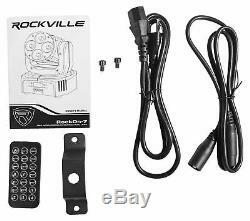 (4) Rockville RockOn-7 16 Channel DMX Intelligent Moving Head Beam Lights + Remote for Stage/DJ/Club/Bar. Condition: BRAND NEW IN ORIGINAL PACKAGING. 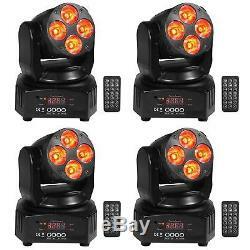 Price is for (4) Rockville RockOn-7 40w RGBW Moving Head DMX Spot Beam Stage Club Lights+Remote. Rockville is proud to introduce our first member of the RockOn series of lights! 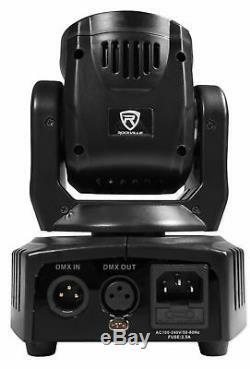 The RockOn-7 is an IP20 rated intelligent moving head light with 16 channels of professional DMX control. 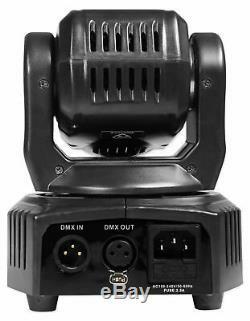 This moving head is super versatile allowing you to control every facet of the light. With the RockOn-7 you can create spectacular aerial light shows using extremely fast pan and tilt speeds. We made these lights to be easy to use for both experts and beginners. We give you 4 different options of controlling the lights. Sound Activated : This is the easiest setting to use. Simply set the light to sound activated mode and the light will go to the rhythm or beat of the music and create a spectacular and professional light show. Manual Control : What makes our light special is, in addition to the standard controls on the back to the light, we included and full-function remote control! From the remote, you can control the strobe effect, pan and tilt, dimmer, color mixing, and more! From the remote you can also toggle to automated programs, and sound activated modes, and more. Remote Control: With the included remote you can control all functions of the light. If you are in manual control, you can control the dimming, color, X and Y axis angles of the moving head. Such as light mode (sound activated, manual, master/slave). 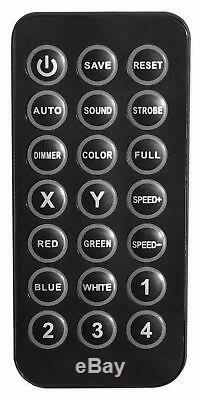 You can also control the speed of the strobe or color changing form the remote. You can also change the light mode (auto, manual, master/slave). Automated Program : You can let the lights run through preset professional automated programs. DMX Control Mode : With 16 channels of DMX control this option gives you the most precise control over the light with a DMX controller. Master/Slave Mode : When entering the light into this mode the light will replicate whatever the master light is doing. The adjustable strobe speeds make this light perfect for bars or night clubs! Add a bit of fog and/or haze and you have yourself a cool slow motion effect which is sure to impress those on the dance floor. 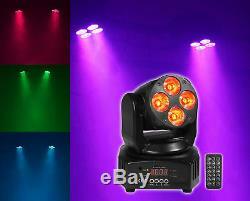 In addition, this light features color change, color fade, dimmer, ID address, and color mixing controls. Our Moving heads use top of the line components. These intelligent lights are the best value on the market. There is no other light with so many great features available at this price point. 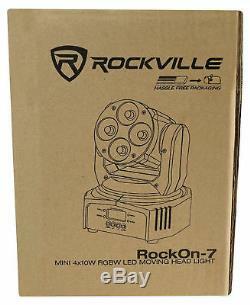 Rockville Rockon-7 Feature-packed moving head beam light fitted with four 10W RGBW LEDs. Includes a full function remote. Emits bright, long-throw effects with tight, concentrated beam angles. Uses 25° lens for bigger washing range. DMX 512 controls (14 or 16 channels). Create spectacular aerial light shows using extremely fast pan and tilt speeds. Strong power arm for fast and precise movement. Strobe effect with adjustable speed. 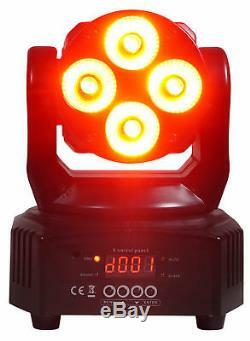 Features include strobe, color change, color fade, dimmer, ID address, and color mixing controls. Project light where you want it with user-selectable pan and tilt ranges. Increase effects with electronic linear dimming and strobe features. Continuous shows with reset of pan/tilt, color, and prism. Master/Slave capabilities so you can run the same program on multiple lights. Built-in, sound-activated programs dance to the beat of the music. Constant current feature helps ensure LED longevity. Suitable for DJs, discos, ballrooms, karaoke, stage productions, bars, clubs, and parties. 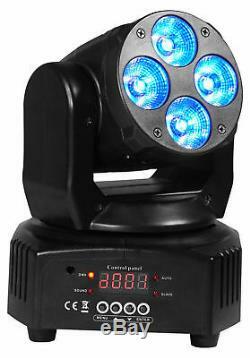 Product name: 4x10W RGBW LED Moving Head Light. Light Source: 4 x 10W 4-in-1 (RGBW) LEDs. Lighting Color: Red, blue, green, and white. LED Life Expectancy: 60,000Hrs. Control Mode: Automatic/Sound/DMX512/master and slave. DMX Channels: 14 or 16. Colors: 15 + white, color gradient function, continuous scroll at variable speeds. Strobe Rate: 0 - 25Hz. Input Voltage: Auto-ranging AC 100 240V/50 60Hz. Product Weight: 4.4 Lbs. Size: 5.7" x 5.7" x 7.9 inches. Shippable Box Dimensions: 12.99 x 9.05 x 8.66 inches. If your item is defective or you want to return it for any reason within the first 30 days of when it was delivered to you; you have the following options. We will send you a. To replace the item for a brand new one. All replacements and exchanges are free. This includes blown speakers with burned voice coils. 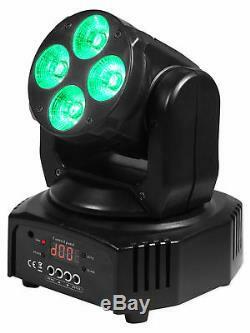 The item "4 Rockville RockOn-7 40w RGBW Moving Head DMX Spot Beam Stage Club Lights+Remote" is in sale since Thursday, September 6, 2018. This item is in the category "Musical Instruments & Gear\Stage Lighting & Effects\Stage Lighting\ Single Units". The seller is "audiosavings" and is located in Inwood, New York. This item can be shipped to United States, Canada, United Kingdom, Denmark, Romania, Slovakia, Bulgaria, Czech republic, Finland, Hungary, Latvia, Lithuania, Malta, Estonia, Australia, Greece, Portugal, Cyprus, Slovenia, Japan, China, Sweden, South Korea, Indonesia, Taiwan, South africa, Thailand, Belgium, France, Hong Kong, Ireland, Netherlands, Poland, Spain, Italy, Germany, Austria, Bahamas, Israel, Mexico, New Zealand, Philippines, Singapore, Switzerland, Norway, Saudi arabia, Ukraine, United arab emirates, Qatar, Kuwait, Bahrain, Croatia, Malaysia, Brazil, Chile, Colombia, Costa rica, Panama, Trinidad and tobago, Guatemala, Honduras, Jamaica, Viet nam.